The Bridge Hotel is located on the banks of the Murray River at Jingellic, a pretty little town on the New South Wales side of the river. Enjoy good old-fashioned country hospitality at one of Australia’s original country pubs, with incredible views of the Murray River and the Snowy Mountains. Canoeing is a treat and Jingellic is the perfect place to go fishing and catch a Murray Cod. Dinner and lunch is available everyday. Six beers are available on tap everyday. The three bedroom house has two bedrooms with queen beds, and one bedroom with two singles. With a balcony overlooking the Murray River, facilities include, use of laundry, television, lounge and dining area. Maximum of six people. 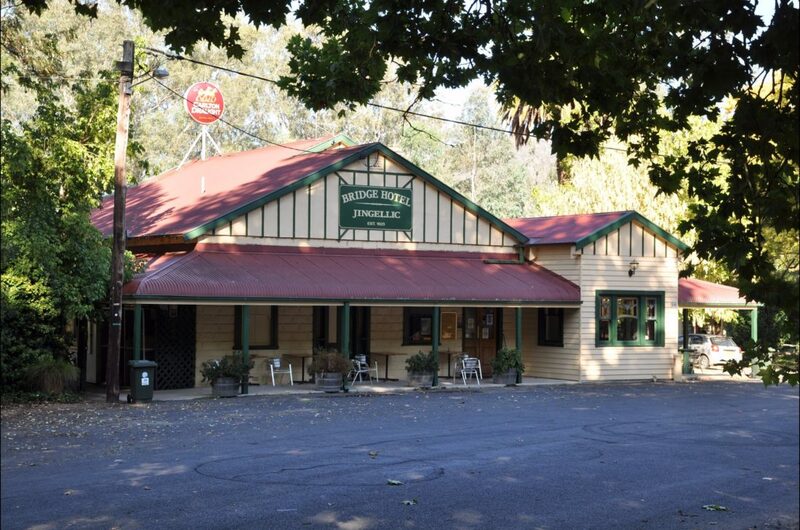 Enjoy good old-fashioned country hospitality at the Bridge Hotel, one of Australia’s original country pubs, with incredible views and quality meals. Dinner and lunch is available everyday. Three cabins are available. One with two bedrooms, sleeping maximum six people. There are two motel style cabins, one with wheelchair access to bathroom, sleeping maximum three people. All cabins have reverse cycle air-conditioning and a television.